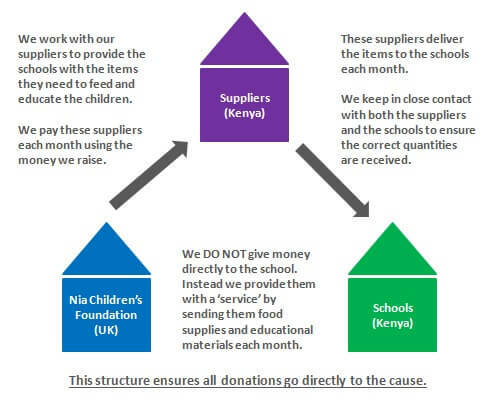 We do not give money directly to the school but instead to external food and educational materials suppliers who deliver the items to the school each month. These suppliers provide us with documentation of the delivery and we keep in regular contact with our schools to ensure the required supplies arrive correctly. We hope the way in which this program is set-up allows donors to feel comfortable that their money is going to the right place and directly to the cause. Our finances are very transparent so if you have any questions about how your donations are being distributed please do not hesitate to get in touch. Please click here to view the charity commission website. 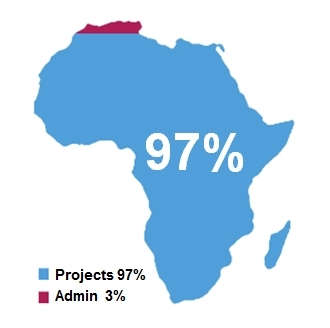 • 97% of donations received are used directly to pay for the food supplies and educational materials. • Fewer than 3% of donations are used for administration costs which include bank transfer charges to Kenya and the maintenance of online donations. NO donations are used in wages or expenses. Our finances are extremely transparent and supporters can see exactly where every single penny of their donations are being spent. 1. Managed by dedicated founders/volunteers – We are run by a small number of committed volunteers who are extremely passionate about making a positive impact on the lives of children in Africa. 2. You know exactly where your money is going – Our donations are handled safely and we are accountable for every penny. Our model allows donors to know that their money is going directly to pay for the food supplies and education materials for the children. 3. Transparent finances – It is very important to understand how donations are used. Our finances are clearly listed on our website and we welcome you to ask any questions you may have.